(Bloomberg Opinion) — Senator Elizabeth Warren’s proposed wealth tax is a more promising idea, I think, than Alexandria Ocasio-Cortez’s plan for a top marginal income-tax rate of 70 percent. A levy that high on very high incomes is likely to be fiscally self-defeating, but an annual 2-3 percent tax on wealth would be a big revenue-raiser even if confined to the very rich. This isn’t enough by itself to make it a good idea, but at least Warren’s proposal is fiscally productive. The U.S. already has various wealth taxes that go by other names, but they work badly. Federal taxes on income from capital — in the form of profits, dividends and capital gains — and taxes on inheritance are varieties of wealth tax. Many state and local governments tax houses and other property as well. The federal taxes are poorly designed and riddled with loopholes. One big channel of avoidance is the so-called step-up basis for capital gains at death. This lets assets pass to heirs at current market values, with any previous unrealized gains simply erased for tax purposes. That means huge accumulations of unrealized capital income escape capital-gains tax altogether. Combine this with a leaky inheritance tax, and wealth can be passed from generation to generation with little or no tax owed. A theoretical case, based on restrictive assumptions, can be made for not taxing capital at all — but as a practical matter, on grounds of fairness and efficiency, it’s hard to deny that wealth and the income it generates are undertaxed in the U.S. relative to income from labor. 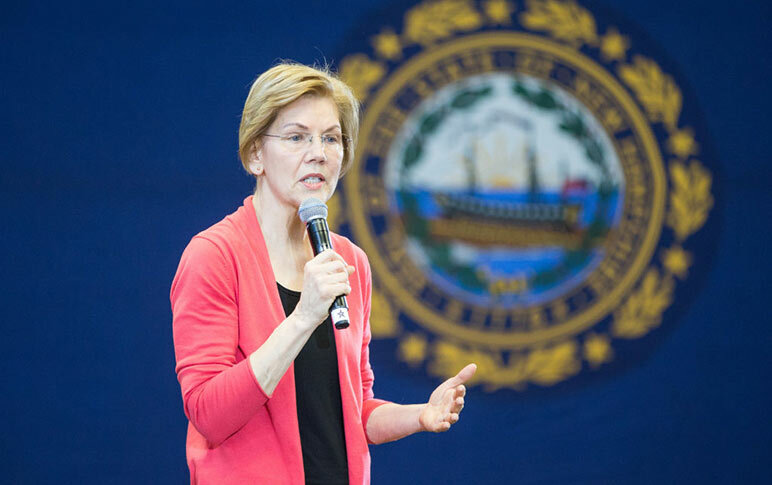 The question is whether a wealth tax like the one Warren is suggesting is a better remedy for these defects than fixing the taxes the U.S. already has — say, by taxing capital income at the same rate as labor income, taxing unrealized capital gains at death, and/or making the inheritance tax harder to avoid. An annual wealth tax certainly has administrative drawbacks — one reason the idea has been in decline around the world. An audit of wealth for tax purposes is a complex undertaking, because wealth can be held in many forms, some of them hard to value. It’s easier to do once per life than every year. Also some forms of wealth — your estate in the Hamptons, say, or your collection of Rembrandts — generate little current income, so the means to pay the tax might not be to hand. Provision therefore has to be made for deferring the tax, as Warren’s plan recognizes. Exemptions or preferences for some kinds of wealth would probably emerge as well, though these would defeat the larger purpose by creating new paths of avoidance. A constitutional oddity could be an issue. The Constitution requires that “direct taxes” (initially meaning all taxes except for customs duties) be “apportioned” by population among the states. This means that if Californians are paying so many dollars per person in federal wealth tax, West Virginians should pay the same — and since West Virginia is notably short of high-tech billionaires, the wealth tax there would need to be higher. The 16th Amendment dealt with this unforeseen absurdity by saying apportionment didn’t apply to income taxes, but Warren’s wealth tax might not qualify. In the end, legal challenges would probably fail, but you can bet some would be lodged. The biggest problem with collecting a lot more tax from the rich, however it’s done, is that they might not bother to get rich in the first place, or might simply up and leave. The U.S. already levies an exit tax on people renouncing their citizenship. (Interesting that the U.S. tax code treats emigration like death and death like emigration.) Warren’s plan would make this penalty for defection more severe. Sufficiently harsh penalties could presumably keep most of the rich in — how about a wall, to be sure? — but the message to foreigners who see the U.S. as the place to make their fortunes might be unhelpful. Nonetheless that very message, directed to the U.S. rather than to foreigners, seems to be the point. Warren is proposing a big new wealth tax for the same reason Ocasio-Cortez is proposing a punitive tax on top incomes. It isn’t primarily to raise revenue or to make the tax system more progressive: There are easier, though less dramatic, ways to do both. The point is to signal a new Democratic imperative: What matters most is outrageous wealth and the scandal of rising inequality. My guess is that most Americans have other priorities, but we’ll see.